The true value of the EHR landscape must be carried through to both the patient experience and the continual evolution of a facilities records and information systems. To do so requires the analysis, capture, deployment, security and storage of data across all the facilities operations - from inventory to point-of-care and back again. The ultimate goal of better patient care and more efficient operations requires extracting and aggregating data from multiple - and sometimes incompatible - software systems throughout the facility. The CSI in partnership with Cyberscience is able to bridge these islands of data. Data is the lifeblood of modern healthcare - a truly irreplaceable asset. Translating that data into actionable information and analytics is the challenge. We must not only maintain but also improve the flow of information, including clinical, financial, revenue cycle, human resources and marketing. A breakdown in any of these streams could prove catastrophic to a facilities operation and, at times, involve life or death scenarios. Actionable information will allow us to set priorities in a dynamic, cross-functional manner where patient care is never compromised despite a complex and ever-changing environment. 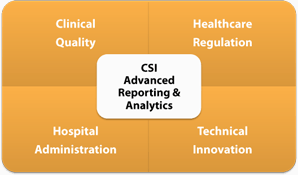 CSI offers Advanced Reporting and Analytics services in partnership with Cyberscience Corporation. Enterprise Cyberquery (eCQ) is a high-performance ad-hoc query and production reporting system that delivers actionable information to users at all levels of the facility. eCQ fully supports all major databases including Oracle, SQL Server, Progress, DB2, Informix Online, Sybase, MySQL, Acucobol, Micro Focus COBOL, flat files and C-ISAM databases with native interfaces. Other systems can be accessed with ODBC. Cyberquery is available for all major Unix platforms, Microsoft Windows 98/ME/NT/2000/XP as well as Windows 7 and Windows 8.
eCQ holds a unique position in the arena of advanced reporting and analytics. This solution provides ease of use, speed of execution and a rich and powerful programming language that allows users of all levels of expertise access to the information they so desperately need. eCQ extends and enhances the capabilities of your current systems, maximizing their ROI. For example, a flat General Ledger report gives basic information and requires addition reports to be written or run to analyze anomalies in the numbers. The Advanced Reporting & Analytic features of eCQ allow "drill down" capabilities. Rather than having to run other reports just click on the links in the base report and view the information that makes up that number. You can continue to drill deeper into the data until you find the answers you are looking for. In most facilities data exists in silos of spreadsheets, databases and scanned images usually at the department level. At the enterprise level there are the Electronic Health Record systems, Practice Management systems and other systems that are "mission critical" to operations on a daily basis. The challenge is combining all that data into a coherent manner to create the information necessary to make evidence based decisions. Whether it is protecting the "bottom line" on the business side or providing "evidence based" patient care and population health management this information is vital. eCQ offers a robust solution to this challenge. The ability to extract data from all those systems and aggregate it into a single "data mart" to run reports and develop dashboards puts decision making power into the hands of every user. We are so confident in our solution that CSI/Cyberscience offers a "30 Day Test Drive" at absolutely no charge to your facility. We will install the software on a server in your facility and develop a base "Data Dictionary" (the real power behind eCQ) of a database of your choosing. You give us your most difficult data extraction pain point and let us solve it. When--not if--we solve your hardest reporting issue, you agree to a contractual assignment with us that allows us to help you with your advanced reporting and analytics needs.